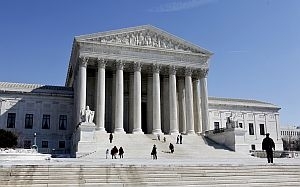 (HOST) Recently, the United States Supreme Court has ruled on two cases from Vermont. Vermont Law School professor Cheryl Hanna suggests that both of these cases show the triumph of moderation over ideology. (HANNA) Never before has the United States Supreme Court heard two cases from Vermont in a single term. The first case, Wyeth v. Levine, upheld the right of plaintiffs like Diana Levine to continue to sue drug manufactures in state court. The second case, Vermont v. Brillon, made clear that delays caused by public defenders were not attributable to the state when considering a defendant’s speedy trial claim. What is remarkable about these cases is that they both suggest that Supreme Court, despite all the rhetoric to the contrary, continues to be relatively moderate, not extreme. Take the Wyeth decision: Many commentators thought that the Court would side with the interests of business, reversing the long-standing precedent that FDA regulations did not preclude manufacturers from making warning labels safer. But in a 6 – 3 decision, the Court rejected the Bush Administration’s position, and instead maintained the status quo until Congress decides otherwise. Even more notable was that two of the Court’s so-called conservative Justices, Kennedy and Thomas, sided with the majority. The decision leaves it to Congress, not the Court or the President, to decide questions of federal preemption. It’s a perfectly reasonable decision. The same can be said of Brillon. In a 7- 2 decision, the Court rejected the Vermont Supreme Courts expansive and problematic ruling that public defenders were state actors. It also said the court had to more fully account for Brillon’s own disruptive behaviors of firing his attorneys and threatening one of them. Yet, it left open the possibility that a breakdown in the public defender system could trigger a speedy trial claim. That doesn’t appear to be the case for Brillon, but defense counsel should be pleased that the Court didn’t let the state completely off the hook. Even more notable, I think, was that Justice Ginsburg authored the opinion. Although she often sides with defendants, bringing together a super-majority demonstrates that the Court is often willing to put aside ideology in favor of reasonable solutions. Recently, I saw now-retired Justice O’Connor on the Daily Show. She steered the Court on the middle course, favoring practicality over politics. Even after three years and the appointment of two far more conservative Justices, I couldn’t help but think it’s still her Court. While Wyeth is a final decision, the Vermont Supreme Court could still rehear Brillon under our State Constitution, essentially reinstating its ruling. I think doing so would be a disaster. Not only would that be legally questionable, but it would also appear supremely political. The lesson from both Wyeth and Brillon is that most cases that seem so unfair probably are, and that reasonable approaches that account for the realities of people’s lives, are far better than those decided to make a point.